File under simple but impressive! This pasta is all about color and texture – cashews makes it rich and creamy, while swiss chard is delightfully chewy and toasted pine nuts provide crunchy explosions of flavor. When cooking with chard, I like to use the whole animal. 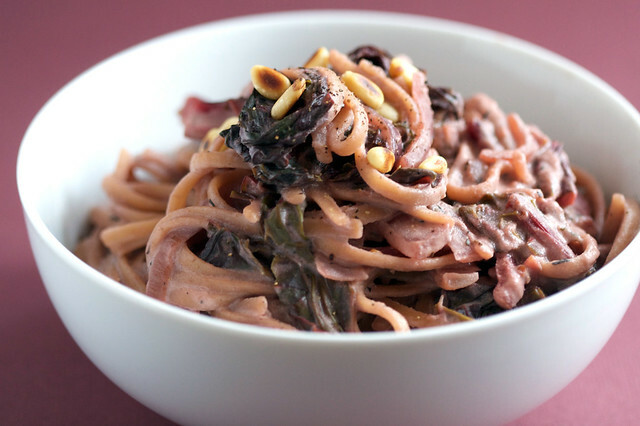 The beautiful red stems and some red wine make this pasta a fun pink hue. I’ve also used a ton of garlic two ways, sliced and minced, so be prepared for serious garlic love! Notes: Cashew creme works best if the cashews soak in water for at least an hour, and up to overnight, so try to plan ahead! If not, it will still be good, just not as smooth and creamy. For the chard, slice off the very woodsy bottoms of the stems, but use the rest of the stems once you’ve stripped off the leaves. Boil water for the pasta and cook according to pasta directions. Drain the soaked cashews and then puree them with 1 1/4 cups vegetable broth until completely smooth. It might take up to 5 minutes to get it really smooth. Preheat a large pan over medium heat. Toast pine nuts until browned (about 3 minutes). Remove from pan, place in a small bowl (or whatever) and set aside. In the same pan, saute onions in oil and a pinch of salt for about 5 minutes. Add sliced garlic and saute for two more minutes. Add minced garlic, thyme, red pepper flakes, black pepper and salt and saute for a minute more. Add swiss chard stems (reserve leaves) and saute another two minutes. Pour in the wine and vegetable broth and turn the heat up to bring to a boil. Let reduce for about 5 minutes. Lower heat and add swiss chard leaves until they are completely wilted. Add the cashew cream and lemon juice and stir until heated through. Taste for salt and pepper. By this time the pasta should be cooked and drained. Add it to the pan, turn off heat, and toss to coat. Serve as soon as you can and top with pinenuts. Wow, that sounds so delicious. I’m going to look for some chard at the co-op tomorrow. Sorry, this is minor- but how much of the pine nuts do we need? They’re in your directions but not the ingredients. Awesome! I totally want to make this sometime soon! Why do we need sliced AND minced garlic? This looks FABULOUS!!!! Red chard is my favorite veggie ever, and everything else looks yummy too! For cashew creme: Instead of pre-soaking the cashews, I blend them at the start of making a meal, and then let them sit in the food processor until I’m done cooking, and then blend again. I figure that the cashews soak during that standing time, and since they’ve already been blenderized into tiny pieces, it takes only a very short time for them to be soaked through. It takes some extra liquid if you do it that way — my favorite cashew cream recipe takes 1/3 additional liquid. Hope that’s useful…. YUMMY!!! Your pasta looks great!! And I bet it tastes delicious too!! I will harvest some of the chard growing in containers on the terrace, here in Dakar, to make this tantalizing recipe this evening. I’ve been looking for chard recipes, so Thank You. The farther I get into vegan cooking the more I’m finding I’m using the phrase, “Isa has never steered me wrong.” I don’t even look at my other vegan cookbooks anymore. I’ve been disappointed too many times with food that tastes like I’m on Detox (which is fine when you’re actually detoxing, not for impressing the wife). This was incredible, I loved the subtle layers of flavor. The red wine/thyme/hint of spice really works well for an elegant, warm meal on a cold winter night. Made this last night – it was wonderful! I will be making it again soon! I made this for my non-vegan parents last night and they loved it! Thanks for your delicious and easy-to-follow recipes. Made this for company tonight – everyone had seconds! Yum yum yum! Should the cashews be raw? 1) any guidance on blending the cashews in a vitamix? 2) a POUND of chard?! I mean, I LOVE me some greens, and I know they shrink a lot when cooked, but I’m used to using a “bunch” or two in a recipe. how many bunches would you say? I don’t have a Vitamix, but I think they would blend much faster than in a regular old food processor. Check after a minute to see if it’s completely smooth. A bunch of chard is usually about a pound, just use a bunch! Very delicious. I didn’t have pine nuts, so added walnuts instead and cut down on the garlic a bit. This was super yummy and even my hubby liked it. I made this tonight. Very yummy. I sauteed some mushrooms with the onions and it came out great! Made this last night and it was damn near orgasmic (and eating it while watching the first good episode of ‘Glee’ in weeks bumped it up to the next level). Is there something I could use instead of red wine that would work just as well? Some veggie broth with a splash of balsamic oughtta be good! I FINALLY made this, and it is heavenly. I love you more every day, Isa! Loved the flavors. It’s as creamy as an alfredo sauce. Brilliant! I had to laugh at the above comment “Isa has never steered me wrong” I say the same thing and I’ve yet to be steered wrong. My red chard thanks you, my hubby thanks you and I thank you for yet another delish recipe…..
Just finished making this which I was going to save for dinner at work tonight, but I totally ate it for brunch instead 🙂 This was my first experience with the cashew cream sauce and whoa my goodness – soooo creamy. I would totally feed this to my non-veg friends. I doubled the sauce recipe because I like a really saucey (italicized and with a racey voice) pasta, and I used spinach fettacuine instead of plain, also added some balsamic raosted mushrooms on top instead of pine nuts, mainly because I don’t like toasting nuts for some weird reason. Soooo good. This one is going in the recipe binder on a 3×5. My friend and I eat this all the time (though slightly altered), and its one of our favorites… So tonight I made it (closer to recipe though made with kale instead) for my omni parents, both liked it, but my mom LOVED it and said she would ‘eat it again in a heartbeat’. Thank you! This is totally in my recipe rotation. I always make it when I want to impress guests, and it never fails! I have to confess: I have never eaten chard, but bought some recently because the organic was on sale. This recipe was a huge hit. My whole family (including the 8 year old) loved it. Definitely a do-again. And I have all sorts of alternate plans for this cashew cream as well. You are changing my life!! This was completely delicious! I haven’t eaten a creamy sauce on pasta in forever it seems! This was completely flavorful, healthy, and perfect! Please for give me, you taught me everything I know about (Italian) cooking, but this is the most delicious cream sauce I have ever tasted. Made this for dinner tonight and it’s deee-lish. YUM. Will definitely make again and again. Thx!! I made this last night, with whole wheat noodles. My sauce turned purple! And the sauce made my pasta turn purple too. What in the world?! I made this for a friend’s going away lunch. Everyone loved it. I subbed quinoa pasta for whole wheat. It turned out beautifully. Thank you for the wonderful recipe! Wow, this is delicious! I couldn’t find red chard nor did I have red wine, so I used rainbow chard and red cooking wine and it came out beautifully. It made a lot, too, which is nice because I love nothing more than cold pasta at 3 am! Got to say I really dug this. I served this to my girlfriend who couldn’t believe there was no cream in the dish. Was also great timing to come across this recipe as I had just bought some red chard down the market the day before! It was the first time I had used cashews in cooking but it won’t be the last, particularly because I bought a 1kg bag of them from the Asian supermarket! Okay I just made this for Valentine’s day for my family, because, well, PINK! And can i just say it is ridiculously delicious. “Isa has never steered me wrong”. Honestly. I need this on a t-shirt. OK….several years later, still making this and loving every magical mouthful…I, too, want the T-shirt…..”Isa has never steered me wrong”!!! I LOVE this recipe! 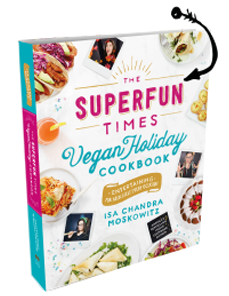 It is my go-to for potlucks and helped in my transition to becoming vegan several years ago. I recently discovered my 14 month old has an intolerance for cashews (so sad!) so I decided to try this with sunflower seeds instead. It was delicious! It definitely had a different flavor but my husband actually liked it better this way. So for anyone allergic to nuts, this recipe is still super delicious subbing out the cashews for sunflower seeds! Ok, so I’m a late bloomer with this recipe, but I have to say it ROCKED. I don’t usually have red wine on hand, so I made a concoction of pomegranite balsamic vinegar and veg broth. I also didn’t have enough chard (rainbow is all I could find at the store), so I subbed with bunch of spinach. I will definitely make this again. Thanks for sharing this recipe! I am allergic to pine nuts – do you recommend leaving them out or substituting with something else? Isa do the cashews need to be roasted or inroad yes for this recipe?